Most people have never even heard of one of the most influential and seminal cartoon creations to ever come out of Japan. It was the summer of 1980, and in an unprecedented spirit of creative collaboration and cooperation, several different artists with ties to no less than four different animation studios came together to create the fabled Super Angel Engine Kurata! The mecha design was ahead of its time. The characters were surprisingly complex and deep. The artwork and animation were superior to anything that had come before. Super Angel Engine Kurata (often shortened to "SAEK", and more often to "Kurata") was poised to be the most breathtaking epic in all the anime world. It had everything that anime fans have come to expect from the best series and movies: action, adventure, comedy, romance, and-of course-giant robots. But the most astounding thing about this series is the fact that outside of a select few individuals, no one ever saw it! It is the story of a young schoolgirl named Kanzaki Yumi, who longs to be one of the Angel Corps, the super intergalactic defenders of Earth during a future era when Japan is the capitol of the world and mankind has begun to spread out among the stars. Yumi so desires to be an Angel that she wears a backpack with angel wings on it. 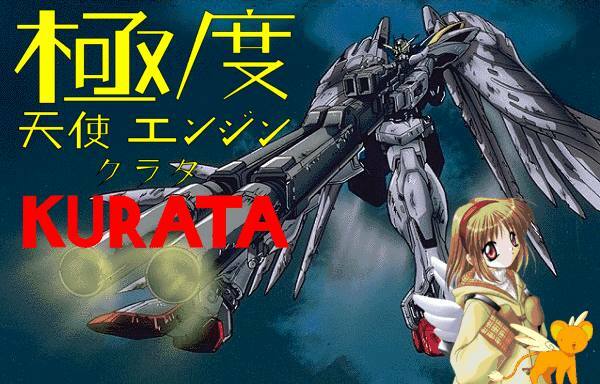 One fateful day, she runs into Toki, the loveably quirky angelneko (Angel Cat) who is a genetically-engineered creature, specifically designed to interface with the Angel Corps's super computer and newest weapon: Kurata, the Super Angel Engine! Before long, Yumi is swept up into adventure and intrigue as she stumbles her way into Angel Training School where she trains alongside her rival Fumiye who has just learned the technique to grow her own Angel wings. The two girls compete for the heart of Tanaka Li, their trainer (who in the third episode would betray the Angel Corps). Yumi and Fumiye must now learn to put aside their differences as they learn to pilot Kurata with Toki's help. Those who know consider this to be one of the best and finest, if not the best and finest anime series ever to be created. Unfortunately, it never saw the light of day. Collected here are some of the promotional stills and random animation cells that were to be put in production. And here, you will learn the story of Super Angel Engine Kurata, and why it never aired. The first thing that most anime afficianados might notice is the familiarity of the characters. Skeptics might even conclude that the promotional images shown here are shoddy fabrications. A reasonable attitude though it may be, it is utterly wrong. I have already had many emails from those who are very well versed in anime, from the popular to the obscure, who tell me that the characters above are, from left to right: Subaru from .hack//sign; Prince Lotor from Voltron (Japanese title: Hundred-Beast King Golion); Ayu from Kanon; Keero from Card Captors (Japanese title: Card Captor Sakura); and Kamui from X/1999 with the Wing Zero Custom Gundam from Gundam Wing: Endless Waltz behind them all. For those who have made this observation, you are right... and wrong! These characters were originally known by the names Fumiye, Raktaga, Yumi, Toki, Li, and Kurata! 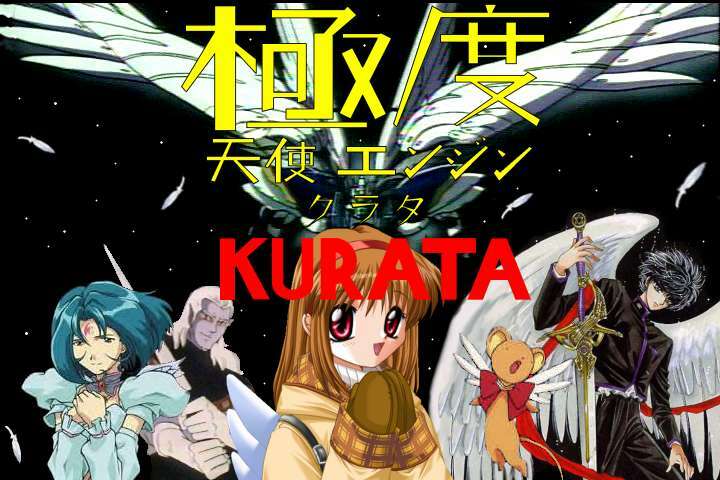 When Kurata was being created, these series and movies did not even exist! (The closest thing to an exception to this would be the Mobile Suit Gundam series, which had been in full swing since 1979.) The characters displayed above were created by the many different studios who contributed to the Kurata project. But mere days before the finished product was to be aired, disputes among the members of the different studios caused them to revoke the shaky copyright agreement they had with the Kurata project team, and the whole thing fell into disarray amid heated legal battles. Sunrise came up with a design that was way ahead of its time in the giant robot genre. The influence of the original ground-breaking Gundam concept was evidenced here. Added to that was an even more radically organic design decked out with giant angel wings. After the dispute, this beautiful new form that was originally the Super Angel Engine Kurata itself would not be seen again until the world was deemed ready for it. This was slowly worked toward in the mid 1990s with Gundam Wing, and came to fruition in the Gundam Wing OVA, Endless Waltz. Naturally, Sunrise denies this and any involvement in-or even the existence of-the Kurata project. One individual who asked about it was very politely encouraged never to do so again, handed some Gundam swag, and asked to leave. When her friend tried the same tactic, he was told, "Don't push your luck, Yankee." Bee Train's involvement in Kurata is rather sketchy. Bee Train was created in 1997 as a subsidiary of Production IG studios. Production IG, in turn, did not exist until 1987. The story is that, in 1980, someone who was instrumental in the founding of Production IG (possibly Goto Takayuki himself?) created Sato Fumiye, the new Angel recruit. She was tough, sure of herself, and often aloof toward other people, especially Yumi. Deep down inside, she was a very kind and generous person. After the Kurata project collapsed, Fumiye was not seen again until her creator managed to work the character into the hit series .hack//sign, in which she was renamed Subaru and given a very large axe. Upon calling Bee Train and Production IG studios, and leaving voice mails inquiring about Kurata, it was discovered that they are both in the running for having the best "phone tag" system in Japan. We're still waiting for either of them to get back to us. Raktaga sneaks up behind Toki in the episode "Fatal Planet 9"
Studio Toei had come up with the ultimate bad boy to taunt and torment the heroines of the Angel Corps. An alien mercenary by the name of Raktaga was their first contribution to the project. He was purple with long white hair, and a wicked blade that could slice through anything. He and Li would eventually be a force to be reckoned with as they tried to hijack Kurata and take over Earth. Undoubtedly the most endearing and heart-warming character of the whole series was Yumi, Toei's second contribution to the project. With her dogged persistence and unflagging optimism, she just knew she was going to be Kurata's chief pilot. The plan was that during the last episode of the first season, she would be in a death-defying cliffhanger (literally) and be ready to fall with no chance to survive. At the last second, with all her willpower and belief, she would suddenly master the method to grow her own angel wings and fly away. Unfortunately, it never happened. When the Kurata project began to break up, Toei reclaimed Raktaga and Yumi as their own. Raktaga was inserted into their Hundred-Beast King Golion story as Crown Prince Sincline. 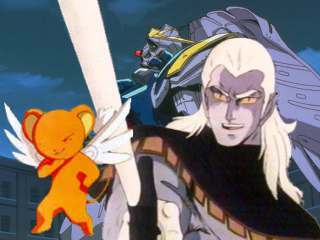 Hundred-Beast King Golion was better known several years later in America as Voltron: Defender of the Universe, and Crown Prince Sincline as Prince Lotor of Planet Doom. Yumi did not resurface again until much later. Almost twenty years later, she appeared as the ditzy but loveable Ayu in the Kanon video game created by Key, which was later turned into a series by Toei who also partnered with Visual Art's. When asked over the phone about Kurata, a spokesperson for Toei responded with, "Kurata? Kurata?! Nanda-to?! Kuso! Baka otaku!!" and hung up. In a relatively unprecedented move, the Kurata project team decided to hire new blood, and give not one, but two major character design jobs to a young female doujinshi artist. Her first character was Toki, the cute element of Kurata. He was the brains of the Super Angel Engine, with his tiny genetically-engineered body carrying the entire sum of the Angel Corps's supercomputer database, as well as the complex control programs required to pilot Kurata. He had a vicious sense of humor but held undying loyalty for the Angel Corps, especially his new friend Yumi. He was very hurt by Li's betrayal and made it his personal quest to bring Li to justice. This young member of the Kurata team also came up with the diabolical Tanaka Li, the traitor to the Angel Corps. Corrupted by Raktaga's promise of power, Li tried to sabotage Kurata and kill the two girls who held the most affection for him. It was up in the air as to whether Fumiye would renounce her love for him, or switch sides and follow him and Raktaga. That was never resolved, and the collapse of the project had this artist reclaiming her two characters. Due to the secrecy surrounding the project, it is difficult to pin down the identity of this artist, however it is known that she was one of four women who would eventually form the group Clamp. From the ashes of Kurata, Clamp resurrected Toki as Keero in Card Captor Sakura, known in America as Card Captors. Li showed up as Kamui, who actually became the hero (or antihero) of X/1999, both the series and the movie. When contacted, the Clamp people were very friendly and helpful... until asked about Kurata, after which they fell mysteriously silent and then apparently experienced phone connection troubles. Further phone calls to them went unanswered. It is difficult to say why so many artists and studios, who were involved in something that was obviously so far ahead of its time, would want to deny this glorious part of their pasts. Perhaps personal pride plays a part. Or maybe it is the bitter legal battles resulting from personal incompatibilities. Whatever the case, this site may very well serve as the only place on the internet where the existence of Super Angel Engine Kurata can be celebrated and the series given its due. Future additions to this site will include more pictures when the author gets the opportunity to scan and... process... them. For now, the author will focus on studying the history of Spagthorpe motorcycles, listening to the music of P.D.Q. Bach, and watching and re-watching the precious pilot episode of SAEK. Until the future arrives, Surf Wisely!